Read excerpts a Dawn Cook’s website. Dawn Cook also writes urban fantasy under the pseudonym Kim Harrison. The Princess Series — (2005-2006) Publisher: Princess Contessa’s dreams of living happily ever after marrying a prince are shattered when her “parents” reveal that she’s actually a street urchin they raised as their daughter to thwart assassins from their real target. Princess Contessa of Constantinopolie has a pretty good life. She's an expert shopper, has parents who love her and are good rulers, and is looking forward to her upcoming engagement to Prince Garett of Misdev. So what if a few pesky assassins try to get in her way? She's been well trained to ward them off — she's not worried. Oh, but she should be. Prince Garett, not taking the advice of his father, arrives in Constantinopolie early, almost six full months before the formal engagement is announced. 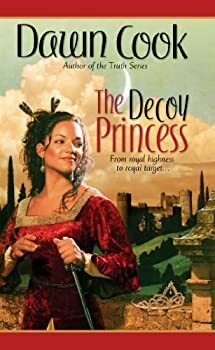 His untimely arrival forces Tess's parents to come clean: she's not the true princess, but a child bought from the street to pose as the princess and ward off assassins. The Truth Series — (2002-2004) Publisher: Alissa didn’t believe in magic, not until she was sent on a journey to an endangered fortress known as The Hold — and discovered the gifts within herself to save it.